SDR, the stone infill "imitating a foundation" may be a way to keep out skunks, which will seek refuge from weather wherever they can find it. In Minnesota, there is a way to get rid of skunks under the porch: Just toss in a freshly boiled batch of lutefisk. Of course, while it gets rid of the skunks, one must then find a way to get rid of the Norwegians. I believe Mrs. Blossom was the daughter of Boardman. It was my understanding that Boardman bought land on the island to create a large apple farm. The Blossoms were probably given free land on which to build. 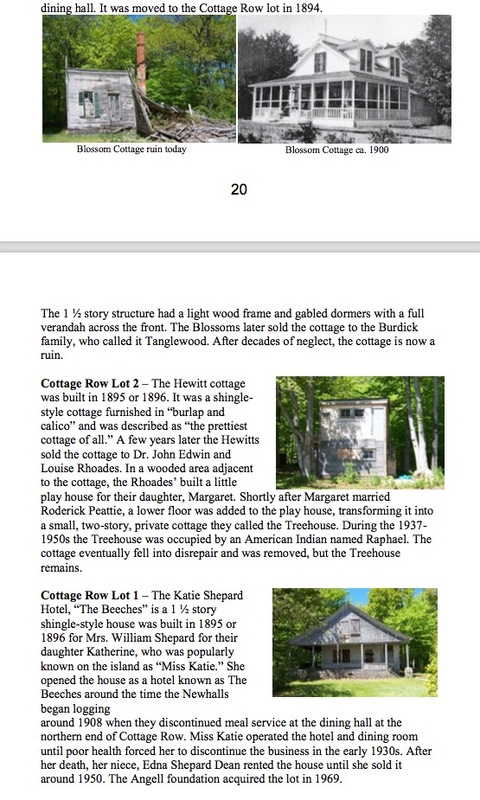 *During the summer of 1893, Silas Boardman’s married daughter, Carrie Blossom, suggested that a resort community be developed on the island, and her father came up with the concept that led to what became known as Cottage Row, a string of ten summer homes along the low bluff facing the lake, just south of the Life Saving Station complex. The owners of these summer places were mainly couples who were friends of the Blossoms in Chicago, one being Mr. and Mrs. Howard W. Foote. 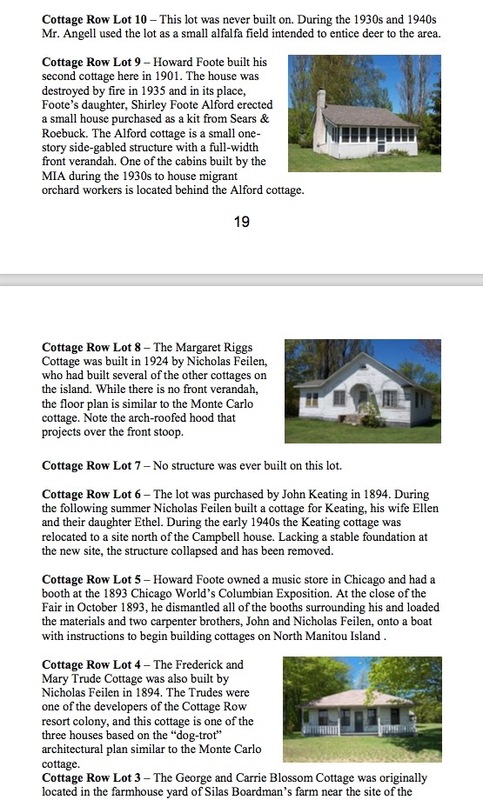 Howard Foote engaged two skilled carpenters at Chicago to build their cottage on the island. According to an oral tradition, the Foote’s owned a music store in Chicago and had been exhibitors at the World’s Columbian Exposition in 1893, After the Fair closed, Foote supposedly salvaged materials as booths were dismantled, including fancy woodwork and stained glass windows, then shipped them to North Manitou for use in the construction of their cottage. One of the hired carpenters was Nicholas Feilen, who was born in Chicago, the son of Prussian immigrant carpenter Christave Feilen (or perhaps “Fealen”) and his wife Catharine. Nicholas’ work was apparently impressive enough that he was hired to build cottages and other structures by several others, which led to him calling upon his younger brother John, a skilled cabinet-maker, for assistance. Nicholas settled permanently on North Manitou, establishing a farmstead with a fine home next to the Bourniques at the island’s south end, supporting himself as a carpenter and farmer. He never married, and died on the Island in 1939 at the advanced age of 87. More: a map which Stafford found online. Stafford found this on the Library of Congress site. The image is not available, there, at a larger size. panel to the porch, and there were no skinny verticals present above the porch railing. Anything else of note ? 'Monte Carlo' cottage? George and Carrie Blossom cottage? What's what? The doors and the open, airy spaces are features not found on typical cottages of that era. The b(m? )olding also has a silhouette that is strikingly similar to Wright’s Winslow House, a home in River Forest, Illinois, that he designed that same year. Would wide doors, open spaces, and moldings similar to Winslow be definitive clues? Were Winslow moldings unique? In any case, it would be interesting to see comparison pictures of the cited details. I'm not convinced at this point. molding profiles at this early stage of his career -- as he not ? 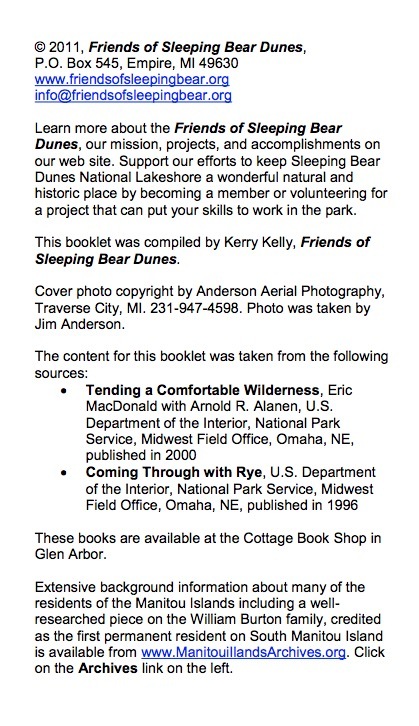 And these are pages from a pamphlet published by the Friends of Sleeping Bear Dunes, with slightly different text from that in the previous entry (above). There is still no hint of where "Monte Carlo" came from; perhaps it was the Blossoms's version of "Dun Roamin'" or "Casa Fiasco" . . .
"Storrer seems to be his usual peevish self, displeased in this case that somebody else might have discovered a new building. Does he have drawings for any of his alleged discoveries, such as that Dutch colonial in Racine? [/b]"
Since delving into Mitchell I have believed there are two arguments against FLW as the primary architect (I accept that he may have helped Corwin). 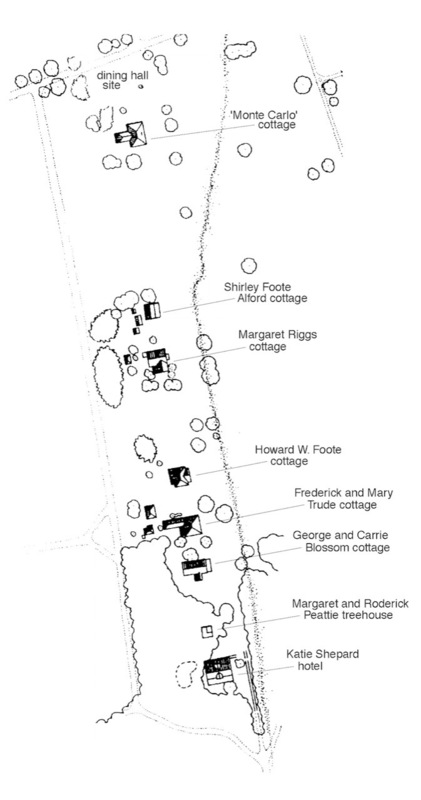 1) The Inland listing which has Wright / Bagley House below. Wright had left Adler & Sullivan and had no reason to hide his work behind Corwin's name anymore. 2) Wright's first commission in Racine was the Mile House remodeling project (1901) which I documented in 2003 with Brian A. Spencer's help. The job first went to Corwin who in 1899 submitted a drawing to the client of a miniature Mitchell grafted on to the existing house. Would he have done this if he had not designed Mitchell? I would think not. I have this in my "Wright in Racine" book and have raised it with Bill Storrer. 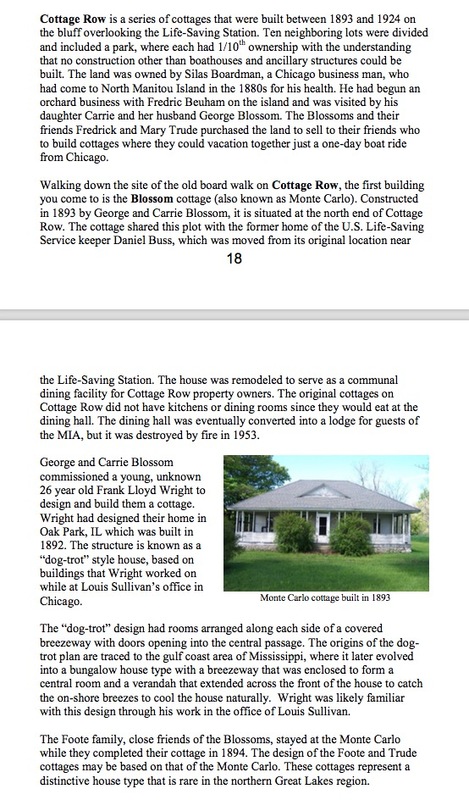 The pamphlet describes the cottage as a "dog-trot" house. Is it still a dog-trot with its breezeway enclosed? Per the old photo, it would seem the breezeway was enclosed very early in the cottage's history, if indeed it was ever open at all. 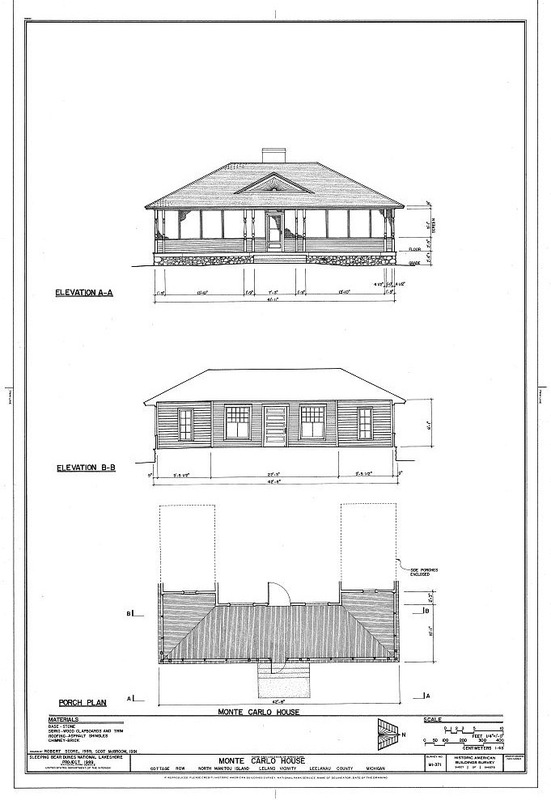 We need to see a full floor plan, not just a plan of the porch. I vote a resounding NO on both Mitchell and Manitou.